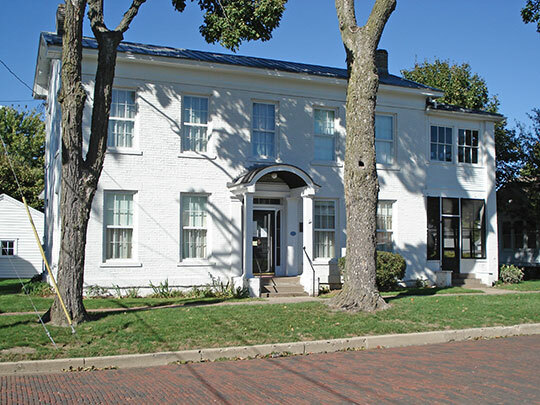 Washington City Hall is located at 301 Walnut Street, Washington, IL 61571; phone: 309-444-3196. Photo: Dement-Zinser House, ca. 1858, 105 Zinser Place, Washington, IL. Listed on the National Register of Historic Places in 2002. Photographed by User:	Esvobod2 (own work), 2006, [cc-by-3.0 (creativecommons.org/licenses/by/3.0)], via Wikimedia Commons, accessed November, 2013. The first settlement in the town of Washington, or its vicinity, of which we have any account, was made in the spring of 1825 by William Holland Sr., who came here from Peoria (then Fort Clark). He was formerly from North Carolina and was employed by the United States government as a blacksmith for the Indians who then inhabited this part of Illinois. He continued to work for the Indians for several years after settling here. He built a log house and his was the only family in or near Washington until 1826, his nearest neighbor being Thomas Camlin who lived on Farm Creek, three miles east of Peoria. In 1834 William Holland Sr. laid out the original town of Washington, being that part of the town now lying east of Main Street. The first building erected in the original town plat was put up by Joseph Kelso, Sr., in April 1834, shortly after his arrival here from Indiana. Early History of Washington, Illinois and Vicinity, 1922, Tazewell County Reporter, publisher.